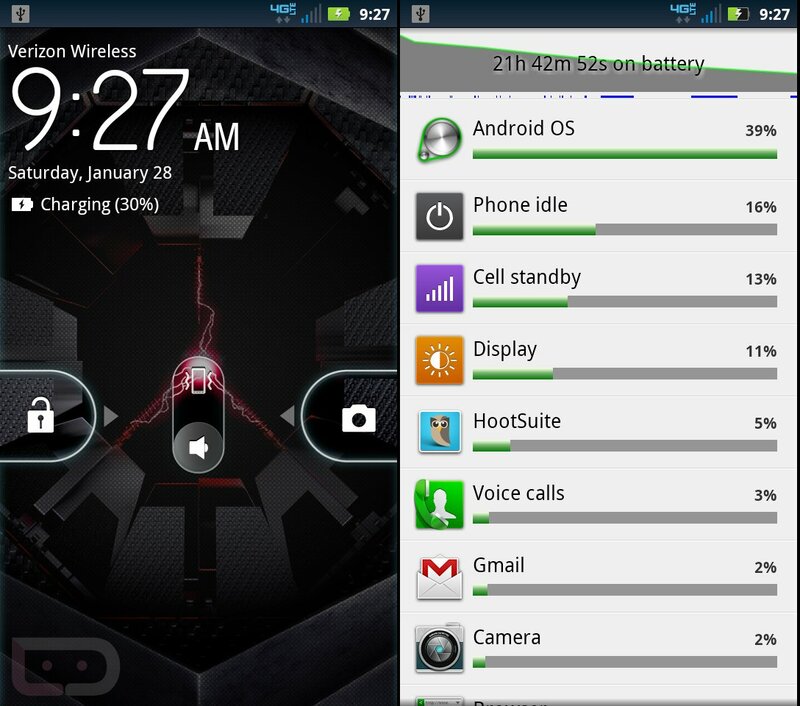 As you can see from the top two screenshots, day 2’s battery test with the DROID RAZR MAXX was the polar opposite of day 1. As we mentioned yesterday, the first charge on a new battery is almost always going to be your worst. You spend a ton of time setting up your phone, plus these things just seem to need a full day or so to get ready for the grind. So while during day 1 the phone managed to get through roughly 17 hours before begging for a charger, day 2 could have easily gone into the majority of day 3 with all of the juice it had left. After unplugging from the charger yesterday at around 10:15AM and taking it through my normal routine of Gmail, Twitter, calendar, browser, some phone, a Blazers game with pictures and video, a night on the town, and 6-7 hours of sleep, the RAZR MAXX still has 30% left. And this is all 4G LTE, folks. No WiFi, no toggling between 3G and 4G – this is straight LTE the entire time. I should also add that my LTE connection at home never reaches 4 or 5 bars and usually sits somewhere between 2 and 3 which could put some extra strain on the battery. As someone that considers himself to be a “moderate” or normal user, I could not be more pleased with these results. My time with the original RAZR, Galaxy Nexus and Rezound could never get me close to results like these on straight LTE. It took a 3300mAh battery to get us here, but since Moto managed to keep the profile of this phone so thin, I’ll take it. How long to charge? I missed this on day 1, but the full charge from 5% to 100% with a Samsung charger took roughly 3 hours. The phone was plugged in at or around 7:15AM and hit the full mark at 10:15AM. Today, I’m going to charge it with the Motorola charger that came with it to see if that will make a difference. Going into day 3, I’m expecting to see similar numbers again. Will report back tomorrow! DROID RAZR MAXX Battery Test Day 3 - Why Can't Every Phone Have This Battery?